Czecholovakian Art Deco Egyptian Revival Beads. 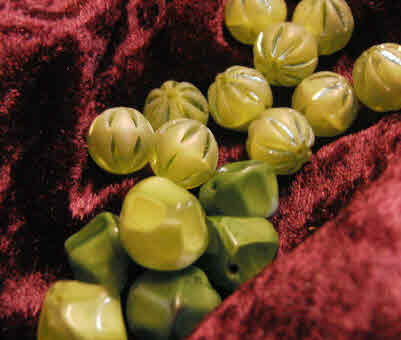 Mass produced moulded glass beads often show a seam at the join of the mould. The iridescence on glass mimicks the weathering found on ancient glass from archealogical sites. We use Preciosa Ornela beads in several designs, formerly known as Jablonex, a name synonymous with quality despite competition from the Orient, this Bohemian producer is still going strong with new designs and finishes regularly released. In 2018 we expanded the range of Bohemian/Czechoslovakian beads in our designs, aping the opinion of Alphonse Mucha that art is for the people, not for art's sake, ie. affordable for all. Our decision to include Bohemian beads in our choice is almost solely due to our love of Mucha and the historic importance of Bohemian beads in the bead trade and Age of Exploration, many of our vintage beads are Bohemian in origin. Bead working travelled up from the Mediterranean to Bohemia where it can be traced back to Celtic times. Initially a cottage industry beadmaking in Bohemia in the 19th century was well established and a world leader, with the advent of communism work was relocated to factories and even prison labour was introduced, with inmates expected to produce a certain amount of weight in beads per day. The Communist government of 1948 disapproved of beadmaking and costume jewellery as valid businesses, so the industry stopped, only to restart ten years later after Stalin's death. Production of glass beads in Asia has had a negative effect on the Bohemian bead makers, but in tribute to Mucha and the heritage of these beads we are more than happy to use them in our designs. Tiny seed beads are tumbled to smooth the edges before being strung onto hanks. Bohemian beads can be found in many sizes and a spectrum of colours and finishes. Some of our vintage Bohemian glass beads, from the mid 20th century. We have worked with Bohemian glass since our early days in the 1980s, with beads ideal for embellishment and adornment.